Pure has completed two projects for Food Store International, an Independent British company that creates and exports brands. First redesigning their premium London Flavours crisps brand for the UK market. Then creating the brand & packaging for the launch of two premium popcorn products. London Flavours crisps were originally conceived for sale in the Middle East and the packaging for this region features places in London with copy that provides a flavour of each area. Click here to view packaging for the Middle East. For the UK redesign, Pure focused on moments from London’s recent history, with imagery chosen for maximum standout in the overcrowded savoury snacks market. 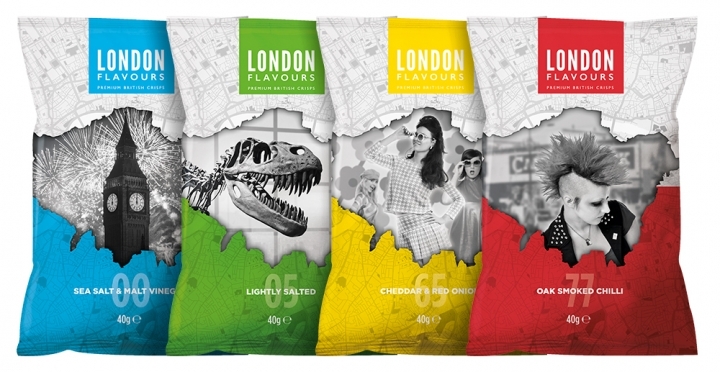 The initial relaunch encompasses four classic crisp flavours with every pack telling a story about London, ranging from sixties fashion to the millennium celebrations. 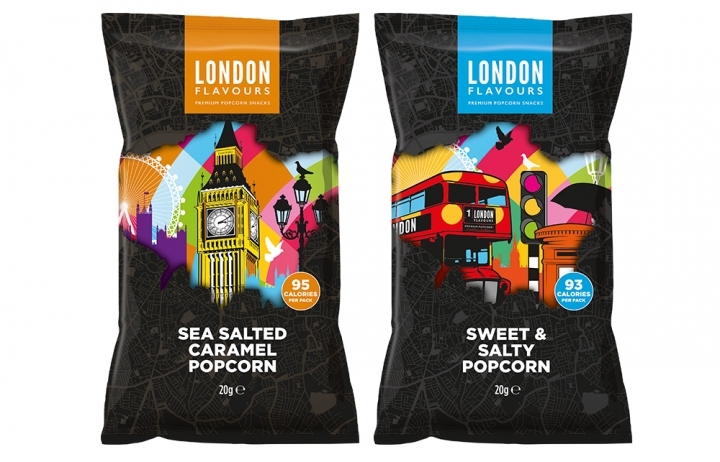 For the introduction of new London Flavours popcorn, made with butterfly popcorn, the design was developed around the premise that every popcorn kernel is ‘a little piece of pop art’. Packs feature pop art montages made up of a number of iconic representations of London created by Pure’s in-house illustrator. Which gives the brand a bright, bold and distinctive look that is unique within the category. Market research suggests the rising popularity of popcorn comes from consumers perceiving popcorn as healthier than potato chips. Something many popcorn brands have latched onto and why London Flavours packaging indicates calorie count per pack.